"...Say goodbye to air compressors, tire levers and pinch flats. Say hello to your full riding potential. *"
"...Say goodbye to air compressors, tire levers and pinch flats. Say hello to your full riding potential." WTB Says: "Our TCS™ (Tubeless Compatible System) technology is the solution for riders seeking high performance, lightweight and durable mountain bike wheel systems that are easy to install, fun to ride and simple to service..."(*Simply add your own TCS Tires and Sealant/setup kit and......Say goodbye to air compressors, tire levers and pinch flats. Say hello to your full riding potential. " What is it? It's a Cafe Bike!! Cafe bikes are road bikes with flat bars and high-rise stems so you can ride with more comfort and control than a regular road bike and far greater speed than a hybrid or comfort bike. 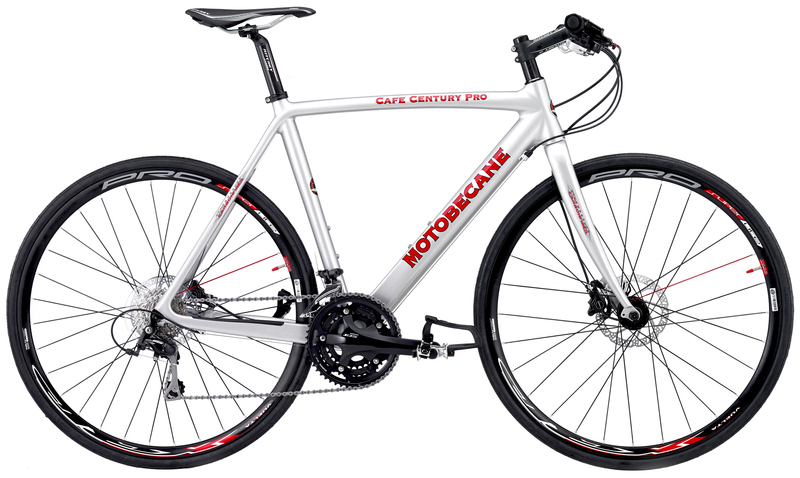 The Motobecane Cafe Century EXPERT DX comforts you with the superior ride of a precision engineered High Modulus Carbon Fiber 12K frame and Pro Quality High Modulus Carbon Fiber Fork and durable, competition quality Shimano Deore and Shimano Ultegra SL 783 flat bar shifters. 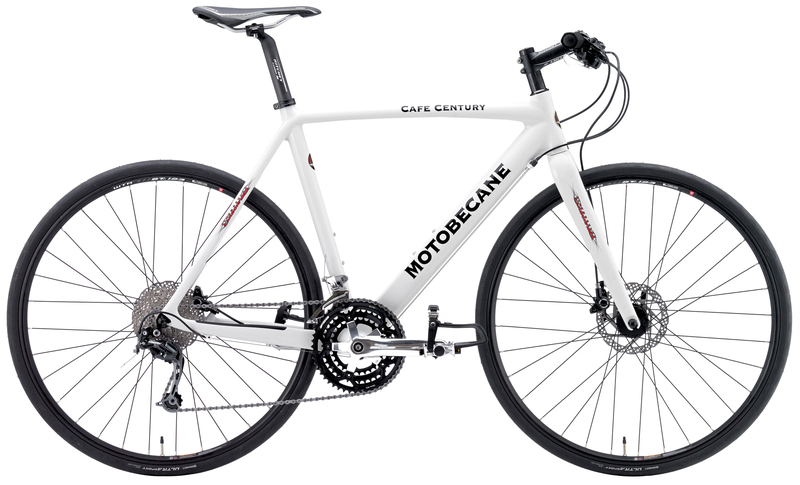 The Cafe Century EXPERT DX improves on the Cafe Century by adding powerful hydraulic disc brakes front and rear. Improves upon the Cafe Noir and Cafe Latte with even smoother riding, shifting and comfort of carbon fiber! Approx. weight per mfg: 18.5 to 19.5 lbs without pedals/reflectors. The carbon fiber frame incorporates some very carefully considered features. All frame tube profiles are specially shaped. The down tube has a custom lay-up of carbon fibers with a special square to oval taper. This is designed for your maximum comfort yet with an extremely efficient, responsive and confident ride quality. The Cafe Century carbon fiber frame is one of the only carbon fiber frame and fork sets that can accept a tire up to 42mm wide*. This means one can outfit the Cafe Century with cyclocross size tires and tackle nearly any road condition with enhanced control and comfort. We managed to get a few of these at a special discount. 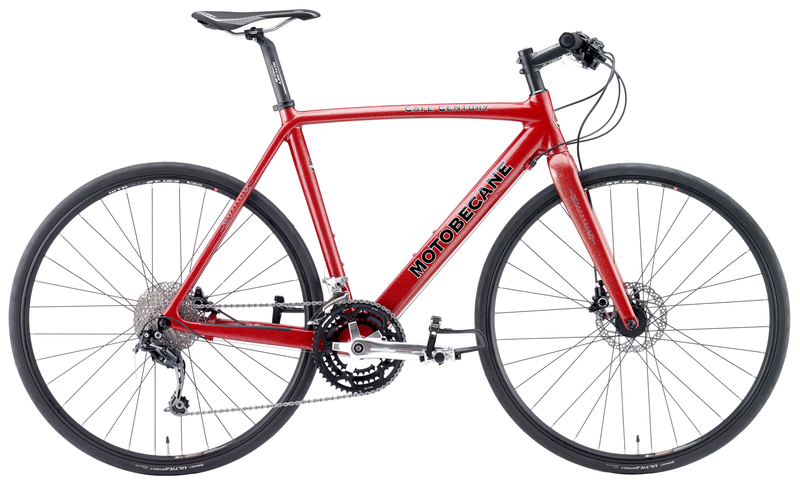 Compare to bikes like Trek FX, Specialized Sirrus or Giant Flat bar, Cafe Type bikes selling for around $2,000 to $2,700. Between sizes? Size up for long arms/torso or higher handlebars and longer reach. Size down for short arms/torso or lower handlebars, more aggressive position. Sizing is a personal choice and the final decision is up to your personal preferences.